Dume Studios is a professional film & video production studio overlooking the ocean directly on Point Dume in Malibu, California. The studio itself is a full-featured green screen cyclorama (green cyc or white cyc, painted on request) complete with studio lighting, video cameras, display monitors and mac-based editing and video capture tools. 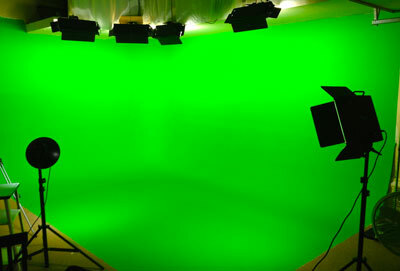 Much of the green screen work for the short film, Americans, with Sean Penn and Kid Rock was shot here. Our equipment page lists everything available, but you'll be excited to know we have a 52" flat screen television rigged to see real-time keying of your green screen shots! The studio is attached to a large, functional home with many amazing outdoor locations on and around the property. The home has a large kitchen with professional stove, television and plenty of seating for cast & crew. The main room has a 1080 HD projector and a 150" screen that can be used to review dailies or for viewing DVDs or footage streamed wirelessly from your iPad or Mac laptop via Airplay and the included Apple TV device, or via HDMI cable from a PC or other device with HDMI output. Wireless internet is accessible from all areas. The front and back yards are available for shooting and/or relaxing. The back yard is a multi-tiered wooded area with a lemon tree, and the front yard is a flat grassy area with beautiful plants and flowers that overlooks the ocean and comes complete with lots of outdoor seating, a trampoline (amazing for pictures! ), a hammock, a grill, smoker and fire pit! The is a very large red-brick driveway with plenty of parking out front. Read more about the area on our location page .